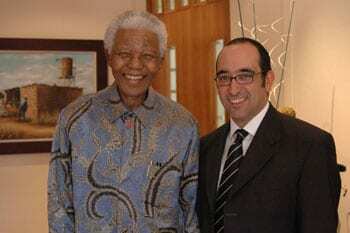 The South African Jewish Board of Deputies plans to publish a coffee table book highlighting Nelson Mandela’s Jewish associations…and wants to hear from South African Jews living in Australia and New Zealand with personal Mandela tales to tell. In the course of his long and illustrious career, the iconic statesman and freedom fighter Nelson Mandela was closely associated with many Jewish people, whether professionally, politically or at the personal level. To mark Mandela’s 90th birthday in July 2008, the South African Jewish Board of Deputies brought out a special commemorative magazine, comprising the personal reminiscences of these individuals who had been associated with him.